In addressing the matter of intellectual property tools for software protection by suggesting a workshop entitled “Knowledge Ownership” I basically opened up a can of worms. At this point I admit that the worms are a bit shy and it has taken me one week before I could write up my notes and thoughts on the results of this workshop. The reboot 8.0 t-shirt proclaimed “practical visionaries unite!” I like the idea of being both practical, and a visionary. Best of all I like the idea of working together. We had a workshop, and we need a sweatshop. Be it that I have an outstanding relationship to sweating, be it that there is much work to do, we have not yet even gotten warm on the issue, much less identified what it is that needs to be done. When the workshop came to a close I had this nagging feeling that I had missed the mark of my goals and expectations by far. Then I listened a bit to the feedback, the notes generated and to my own views of where we got and were we are, and my conclusion is that the worms are shy and need a bit of fresh air. Yes I missed the mark of my expectations, but then they were huge. I got an email from JF Groff to remind me of the patent commons, and yes, that is one step in addressing some of the present needs. More action is however needed. At reboot 8.0 intellectual property was an issue is several presentations and discussions. Of those that I attended there was , Tim Pritlove‘s “Creative Chaos”, Rasmus Fleischer “The Grey Commons” and the news item of “Pirate Bay” that gave me the chance of witnessing one cool Swede not so amused at what the police does during working hours. In our workshop we did focus on software, which in my view is a category in itself and not necessarily served by the same tools as music or graphic arts. We – geeks – are not where we need to go in terms of having an appropriate tool that is fit for purpose in terms of dealing with software as intellectual property. I had great fun at this workshop, the level of participation was excellent and we could have gone for a couple of more hours. I was fortunate enough to have a group of people show up that were truly ready to think, some I had interviewed in preparation for the workshop. The goal was to create together though a bit of thinking, prodding and provocation what may be the next action in finding a fit for purpose solution to the problem of software protection in the intellectual property domain. We arrived at the consensus that indeed the present tools do not work. 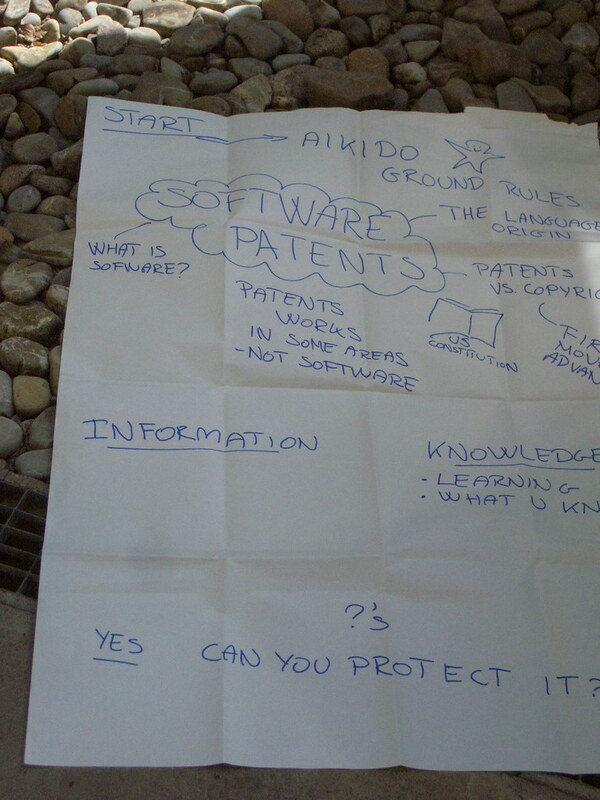 Patents do not work for software protection. Copyright does not work for software protection. Still all that I could think of when starting the workshop is my friend Juba Nour‘s advice “Come to class, take in what is there to take, and get rid of it. Don’t accumulate what you know. Tomorrow you are a different person from today. Tomorrow’s class is another one. Unload your memories, knowledge and habits and come to train fresh.” (Reference: “Shiun” July 2004). Why did I quote a 6th dan Aikido Shihan when at the onset of this inquiry? For me, coming to a workshop looking for solutions and action that is fit for purpose does require a fresh mind. To have a fresh mind, you need to be informed by your knowledge, but you do not need to have it clutter your thinking. So we asked ourselves what is it that software is? Is it information or is it knowledge? Can software – the information – be protected? While there was a consensus that software can be protected, it being information, not knowledge. Knowledge can be owned, but it is dynamic and bound to information through human intelligence, being a human intangible asset, the question remains if that knowledge can be owned by any other than the cognitive beings operating it. Take this though a few rounds of thought and the idea of general intellect as discussed by Adam Arvidsson and we know that this a beautiful philosophical question that is very relevant to what we are trying to figure out here. That is, what kind of protection, if any, does software need? I asked the question of what it is that software needs. I had help from somebody whose face I remember clearly and whose name I did not make a mental note of, who created two flip chart pages (1 and 2) of notes. UPDATE: Carsten Ohm, it was. Many thanks again Carsten and Ton for commenting and filling in my memory blank. One of these pages summarizes the results of the workshop rather well. Prior to this very brief and in a rush brain-storming we had established the consensus that copyright and patent law do not cover the needs of software. My question remains, how do you bridge the gap and deal with the fact that right now conflicting tools exist that are aimed at protecting software? What is it that is being protected? 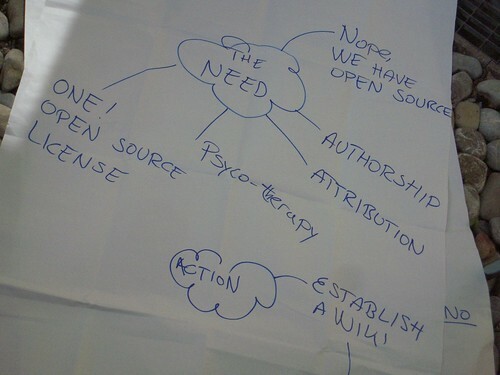 The action generated at the end of the workshop – that is a few minutes after it ought to have already been concluded – was to create a wiki to discuss these issues. What we did not get to do was to find a few brave willing people willing to join forces and brains in starting up this wiki. Go ahead, challenge us! Comments, emails and welcome.